Dilzio was the logbook entwining fabulation with real-world events, an ongoing written record and disjunctive dialogue between the plants, people and elusive patabotanists behind Borrowed Scenery. It combined a partial and diffracted, semi-synchronous log of actual occurrences in the Vooruit's Snoepwinkel in Ghent and the surrounding neighbourhood, mirrored in the collective imagination (and hallucinations) of participants. 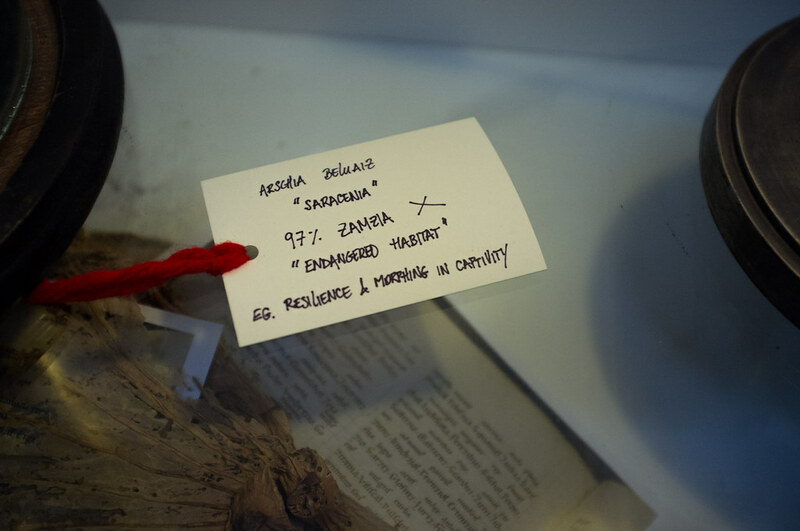 Dilzio entries hinted at an entire reality unfolding behind the physical one, suggestive of multiple entwined plots and narratives that could have been transmogrified into actuality but often remained elusive and potential. We have finally started setting up in the abandoned candy store. Our new laboratory is located in a big room at the end of a long, narrow corridor. Cloudy light filters down through large skylights high above, suffusing everything in eery muted whiteness. The strangest thing about this room is that there are no plants in here yet. They will arrive tomorrow; today we have to set up the furniture and struggle to make sense the first pieces of botanical translation machinery our assistants have found for us: scouring as they have the peculiar shops and fleamarkets of a nearby city for useful equipment. Herbert Taraxi has faced many challenges in trying to devise interfaces between the stagnant technologies of this world and the sentient alchemy he is most familiar with. He continues to complain that the voices of plants are almost impossible to detect using available microphones. And so he spent the afternoon curled up, brooding behind the sofa, impossible to rouse. I distill my potion beside forest pools in the first light of dawn, under the slowly sinking silvery moon of late summer. In these forests I collect wild verbena and lady’s mantle, which grow in the hidden dells and culverts where falling droplets of moonlight congeal. These droplets of alchemical moon water can be preserved using a delicate crystalline apparatus. At a moment just after the false dawn, when the coolest, palest colour of the day filters through the leaves of the forest, I infuse these droplets with scents that are condensations of dreams and memories, and mingle them with the volatile essences of verbena; then my potion is almost complete. I prepare another vial of concentrated morning dew, condensed from the twilight mists of the forest just before dawn. Served in the right way, I hope that these substances can imbue the thoughts of those who take them with inner landscapes. Two drops of the potion are dripped onto an Alchemilla leaf held in the cupped hand of the drinker. (These leaves must be folded into the protective pages of a book made from ancient parchment, to preserve their sustaining properties.) At the same time as the potion is drunk, the elixir of concentrated morning dew must be sprayed in a fine mist above the drinker’s head. Those who partake of these substances will catch a fleeting but piquant vision - an awakening landscape of Viriditas. Amidst the hurly-burly of the picnic carnival in the Citadelpark, a mysterious alchemical landscape started to emerge, somehow woven in between and behind the hectic antics of the tinker-dandies and baffled but curious visitors and passers-by. It could not be seen or touched from the outside, but unfolded in the collective mind of those who partook of the moondrop potion ritual, and perhaps spread by osmosis into the minds of those observant enough to notice. Perhaps this landscape was nourished by the intermittent drizzle that fell over the park. The landscape was strangely similar for many, but occasionally contained incongruent bricolages and peculiar densities. It was probably somewhere very far away and not quite of this world, although many of its images emerged from nearby and intimate places. The landscape is a picture filled with leaves, where forest rain falls in the first chill of autumn; a misty time of day with traces of humidity; damp, fresh, growing, and wet on the face. There are pools of moonlit water into which you plummet, pulled upwards and downwards at once and sucked ever deeper into a place where you can just be, behind the whirlwinds and finally at peace with the daemons. Creatures faint in a lemony scent, and sometimes the taste of peppermint accompanies problems with technical parts and nearly-destroyed nature. Somewhere else you catch glimpses of a silvery metal in straight, angular, and machinic shapes, amidst waving grass and endless fields of fairy floss, suffused in a sweet, pinkish colour and tasting of honey. Further away, perhaps, you come to the shore of a place that may be Italy, where intensely comfortable boats float in the warm twilight. Further still, and you reach a lush, nearly deserted island where ritual initiations are taking place; you want to swim in the warm waters. In the early morning you waken to the blue, orange, violet and purple pastels of another dawn, in the mild warmth of crisp, sweet sea air, smelling slightly of fish. Or maybe this landscape is nowhere else but your parent’s garden in summertime, a bright place where time no longer matters. But then you’re abruptly shaken from your reverie by a feline creature covered in golden hair riding by on a bicycle with a million spokes, her hair growing longer with a lingering aftertaste and innumerable small creatures emerging from all surfaces. Castuus made a rare appearance in the Snoepwinkel yesterday and was much more talkative than usual (in fact he never really talks at all). Evidently something was troubling him, for it’s usually impossible to find him anywhere else than in the greenhouses; the city and even our secluded enclave is so noisy and busy for him, and all he wants in any case is to dream green dreams away from everything. What had impelled this sudden and impulsive drift into the world? I overheard him in conversation with one of the research assistants - she’s the only one who’s ever been able to exchange more than a few words with him - but today he was positively animated. It turns out that, while sitting in the deepest recesses of the greenhouse, he began to hear a mysterious singing. Some ferns, normally so silent, had begun a plaintive melody. Somehow this roused him from his meditations, though their singing was softer than the splash of falling dewdrops, and a strange restlessness took hold of him. And so he left the greenhouse, and made his way into the city. Looking around him, he began to feel a jarring, restless melancholy about the people he saw everywhere. He felt they seemed to be so fearful of stepping out of the busy world of shopping arcades, cars, self-importance, and bustle. He approached a group of young ladies who appeared to be deeply absorbed in a mystical trance, buying makeup, clothes and shoes. Believing them to be kindred spirits, he suggested they come away with him to the greenhouse to listen to the singing of the ferns - surely a meditation they would deeply appreciate, since they evidently had mystical leanings. But instead they seemed shocked, and looked at him as if he were crazy. Castuus was taken aback and somewhat hurt. Then he thought he should try to understand their point of view. He tried to absorb himself in spiritual contemplation of fashion shops and perfume advertisements. He quickly became intoxicated, though somewhat queasy. People were indeed onto something here - it was a state that had a certain distant similarity to the contemplation of singing ferns - but instead of a sense of lightness and clarity he found himself becoming increasingly vague, heavy, dispirited, exhausted - as if he were seeing the world through a bag of cotton balls. Somehow he stumbled through the shopping arcade and came to a shop selling pillows of grain. He bought one pillow full of spelt and another of buckwheat and staggered, exhausted and dispirited, into the Snoepwinkel just before closing time. He went to sleep on the mezzanine with both pillows upon the fossilised plastic grass. The queasy restlessness of the day disturbed his sleep, and as he twisted and turned he moved his head from one pillow to the other. Then he noticed that his dreams changed depending on the grain. A different quality of Viriditas seemed to fill his sleep depending on the different seeds under his head. Late that night he asked Hazel, Ivy and Frazer to try an experiment, sleeping on the different pillows to see what their reaction was, inscribing the results on the wall next to his makeshift bed. All of them experienced a similar phenomenon - distinct dream states depending on the pillow. He convinced us that he needed to stay on and sleep all day to discover other ways to reach people in their dreams (when they are closer to their vegetal minds). We reluctantly agreed to this, though we left him and went on a field trip over several days using Zizim. Somehow during the night our laboratory was transformed into a jungle. The light changed; the walls dissolved; or rather, we can now walk right through them and into other locations. Maybe the plants seeped down through the skylights while we slept; perhaps the machine elves were at work. Our room is now filled with a mesmerising susurrus, and we carry out our research like somnambulists. Celsa Rizofor has discovered a new soma - I am tasting it now, and it is really good. When the assistants water the plants, the room floods. Many of our notes are washed out onto the streets and into the canals that surround the abandoned candy store, to be discovered who knows where. To escape the deluge we move upstairs and sleep on ancient grass that was fossilised in plastic - it still retains its green pigment after all the passing of the eons. A general rule of thumb is that human beings dislike being mistaken for vegetables. I made this mistake quite often during the carnival when introducing people for the first time. A gentleman who struck me as the spitting image of a carrot objected vehemently when introduced as such to a young lady who resembled nothing so much as a wilted lettuce. The gardens were deserted in the twilight. I walked along the paths towards the greenhouse as if invisible, my lantern casting the palest of green halos through the trees, my footsteps echoing with the imprints of those forgotten sounds that have always seemed peculiar to this world alone. (Trismegisto believes that these sounds are doorways.) As the night descends, the cool furnace of the greenhouse is palpable from a distance, radiating the substances captured during the heat of the day in a continuous gentle wind, seemingly impalpable to the natives of this world. This emanation renders the glass walls viscous and easy for me to pass through. I stepped into the scintillating luminosity that is not light, and took up my customary seat in the grotto, listening without sound to the movements of a slow metabolism that is the synthesis of light and earth. Thus I pass many a night on this world. So many jams to prepare in so little time and now my assistant has asked me to write it down but I don’t have much to say. As the autumn days shorten I find myself more and more in the fields and forests at twilight, hurrying to gather fruits and herbs and the last of summer’s bounty. My kitchen is overflowing with jars and liquorice, pots, pans, alembics, bottles, children’s toys, it’s such a mess but what can you do, life is bubbling up like hops. We’re all thinking about the winter to come and the many feasts round the hearth and home and at bonfire festivals. Wines and oils, juices of berries from distant lands, and there’s so many ways that the essences and the substances can be preserved - they’ve got to last for the long winter of course, but it’s much more. When I make strawberry jam some of the essence of the beautiful strawberry princess herself is distilled in the jar. Strawberries in the winter. The patakitchen was transformed into a distillation laboratory for unusual essences, the last taste of summer in this autumnal hemisphere preserved in oil. I worked all day gently distilling and brewing four interesting essences which were then taken and shared at the Harvest Festival with the help of some dedicated and assiduous assistants (who also helped carefully label and explain each preserve to fascinated passers-by). Trismegisto has returned with a whole van-load of peculiar apparatuses acquired from a recent auction held by a biotech company after it went bankrupt. He's added these to his growing hoard of scientific instruments - many of them found mouldering away in the basement of a local university. (His research assistant had to be bribed, because he claimed that in order to take these apparatuses he would need to orchestrate a midnight raid on the university, effectively breaking and entering. Apparently it seems we can't simply ask the university directly to lend us equipment that they don't even use.) We can only find space for these often enormous and clumsy machines in the labyrinth of disused rooms connecting to the Snoepwinkel through the one window opening onto the loft of plant meditation. This is also a cause for some concern, as these rooms are leaky and dilapidated, their walls and floors often close to collapse. Clearly Trismegisto is becoming impatient to advance his work in the most direct (and sometimes unsubtle) manner, inspired by a previous frenetic burst of research into the archaic technologies of this world (some of his notes on this can be found here). 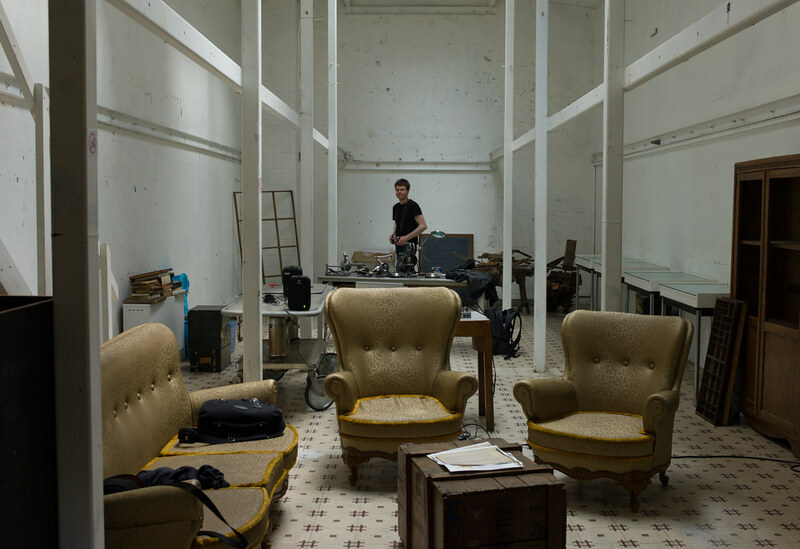 He has set up an entire rig of interlinked machines and is constantly making forays deeper into the abandoned rooms of the building where our lab is, assembling and disassembling devices, cords, tubes and pipes. Sometimes he can even be seen furtively crawling out of a manhole across the street; no doubt he's discovered underground catacombs in which he has expanded operations. However, nothing seems to be working properly. He is often heard muttering that the machines are “apparatuses of metamagical torture,” and that the software they run on has been “coded by drunken mountain apes with delusions of grandeur.” Again and again, he expresses the profoundest scepticism that the original purpose of these devices was to interface with biological organisms in some way. This extreme disillusion has fed tensions between Trismegisto and his research assistants. Not a day passes without heated arguments; these arguments often lead to fits of screaming and the assistant being quite literally ejected from the Snoepwinkel in tears of frustration. And yet today one such argument took a dramatically different turn. The assistant was trying to explain for the hundredth time that just because a machine looks somewhat like one that can be found in our dimension doesn't mean that it works the same way, and ended up screaming that Trismegisto was “nothing but a downright cargo cultist!” The rest of us thought this would be the cue for his instant ejection, but instead Trismegisto's face lit up and suddenly he asked if the assistant wouldn't like to elaborate on his idea over a drink. Flabbergasted and confused, the assistant nevertheless reluctantly agreed. sincerely said, i really found your remarkable books by accident when surfing internet yesterday. i had forever want tell, you really do raise so many of good point. exactly! success, it would goes wished to you in your future career of what kind i wait to see with big anticipate. keep on that cruising way! i respect hear anything you tell for very long time. It is not the place here to present a rigorous critique of the prevailing viewpoints we have frequently encountered while engaged in our researches in this dimension. But there are certain apparent biases in humans that are so baffling we cannot let them pass without at least some further if desultory remarks. In short, it seems that the fallacy of misplaced intangibility is at the root of a good deal of misunderstanding between humans, plants, and us. Theorists and philosophers here have come up with the notion of the fallacy of misplaced concreteness to describe what they variously call fetishism, animism, homeopathic magic, or even by extension such practices as cargo cults. The fallacy is, however, not one of misplaced concreteness, but its opposite, and it is exactly this that makes it so difficult for plants to understand humans or communicate with them - and of course for the representatives of our own patabotanical guild as well. I was going to say more but it will just turn into a rant from here on, so enough said. Frazer, please read your PMs. I'd like to keep this board on topic if possible. The art of being most relevant in the most irrelevant circumstances. Herbert's really onto something here. Inspired by a heated debate with his assistant, we've discovered a peculiar practice that might work wonders in stimulating deeper communion with plants among our test subjects, the general public, and all those humans we hope to make contact with in this strange world. The practice apparently originated in the tropics just after the War, and works akin to our own familiar technosyncretic magic. In general it works through contagion and mimesis, though is perhaps better understood as homeopathic alchemy. Fraser has officially declared the Patabotanical Cargo Cult Interior Design Challenge. 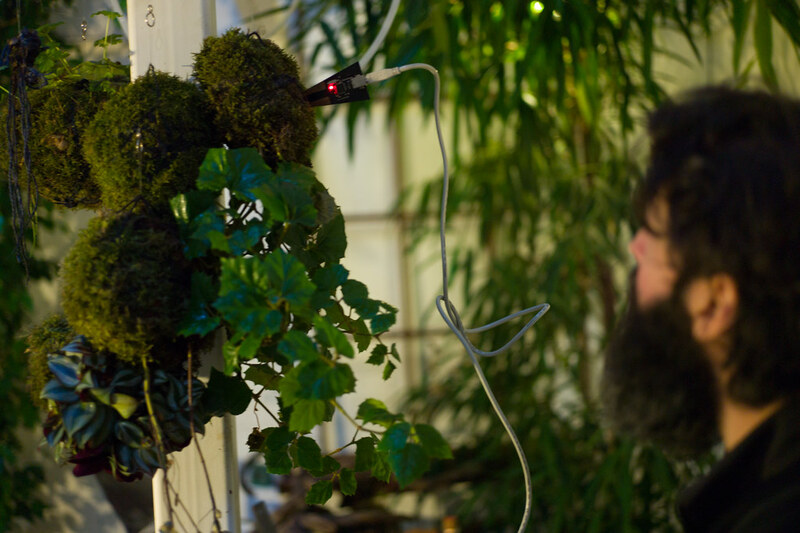 We are hoping to trick people into plant communication through a meticulous simulation of plant-machine entanglement that is usual in our reality, but must be reached through special contrivances in this one. We will charm visitors into Viriditas through contagious and homeopathic interior design. Everyone's now working furiously to outdo each other in the most meticulous imitation of patabotanical human-plant-machine entanglement they can imagine. 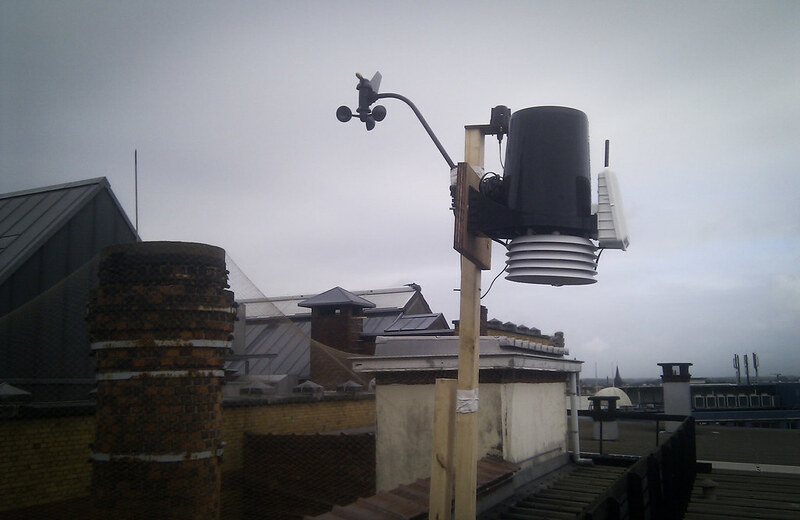 Weather station IVLAAMSG62 finally installed and operational on the roof of the Vooruit, Gent. We now have a continuous readout of temperature, barometric pressure, wind speed and direction, rainfall and solar radiation for the exact location of our lab. The implications of this for our research will be significant. 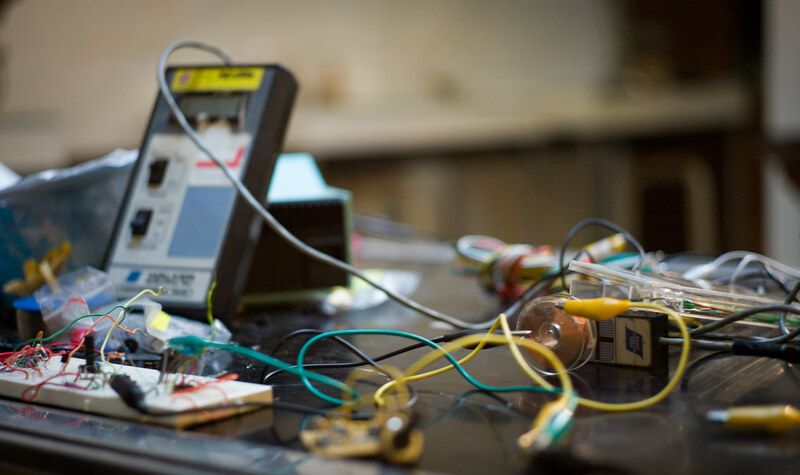 As a technological sensory organ, the weather station can provide us with a simulation and window into plant perception, as it records the features of the environment essential for a plant's life and development. We can now siphon this data elsewhere and transpose it into other forms, such as an auditory experience of the weather. I saw this when it first came out in eDit_C#. It struck me as being a rather poor piece of journalism at the time, and though I grant that it is perhaps more “on topic” in this forum than it ever was in the magazine, my opinion remains unchanged. In sum: why would anyone waste time on this? Thank you for your comments, uncookedprecaution. Maybe if you followed some of the links (or read some of the other forum posts) you might find some 'context'. Re: fabrication, I suggest you contact the magazine directly for further clarification. Thu Oct 11, 2012 3:52 pm SPAM DETECTION SOFTWARE HAS FLAGGED THIS AS SPAM. Motionless Detector wrote:Re: fabrication, I suggest you contact the magazine directly for further clarification. When your magisterial words, I was my mouth fell right open. Far away! Your powerful and effective ideas took me on the next great wave and earnestly wish triumph in some latest presidential elections. Your support given to you I tremble with awe. This time I trust with all my soul right and sincere collaborations after reading your soulful mind eye, it being! Reproduced below is the first part of an extremely rare interview with three patabotanists (unfortunately the others could not be present for the interview). Magnus Dieter, staff writer for eDit_C# Magazine, managed to catch up with them between pataportals in Cornwall. Magnus Dieter: Where are you from and why did you come here? Alchemilla Lily Umiliata: We are researchers and generalists from a parallel reality where plants and humans communicate and collaborate through sentient technology. We became interested in this world when we stumbled on an article on the internet about human-plant communication here, or rather human-plant non-communication, as it turns out - the article mainly discussed the possibilities. And it did seem clear that there were a lot of possibilities, but also how far things had to go before a real collaboration could exist. Mandrago Fraser Mithrodin: You understand that both our realities share the internet; I don't know why. It's quite old-fashioned that way. I'm rarely on the internet myself, it gets boring. MD: And so you decided to intervene? How did you get here? ALU: Not really intervene, but yes, there are these activist movements and artistic and political interventions in this world, and I suppose that what we are doing could be seen in relation to that. As we learned more about your world, we had all become quite concerned about the non-communication between plants and humans, the absence of organic sentient technology and so forth, so we wanted to do something. As to how we got here, maybe Fraser can tell you more. ALU: Fraser, what do you mean? MFM: Well, a few of us decided to try a different approach after all that. And so we ingested Salvia divinorum, which was interesting but terrifying, and probably when all the bouncing started. It actually allowed us to bounce all the way between realities, and so that's how some of us ended up here, and the others could follow through the fluffy wormhole between worlds that we pioneers created. MD: What were your first impressions upon arriving? For example, we discovered an abandoned candy store located in Gent, a city that is very congenial to our interests as there is already a lot of activity and engagement with plants. It seemed to be a place where an incipient plant consciousness was ready to bloom. We converted the abandoned candy store into our base where we could research and experiment, of course, but also further study and understand your cultures by interacting with visiting natives. To this end we've been growing a salon where visitors can experience the essence of plant consciousness. It's an ongoing work in progress, and changes with the seasons. THT: We also gradually started to see some potential in the technologies discovered here. Due to their inherent limitations we found it difficult not to dismiss them out of hand at first, but these very limitations inspired us to devise some novel workarounds, and I think it would be fair to say that at this stage we are quite excited by developments. THT: We established a pataportal to Cornwall that links online and offline worlds. A weather station has been installed, and with the data feed from this we can start to simulate sentient transmutation processes between humans and plants through a variety of mediums. These were all developed largely using indigenous technologies, though of course the pataportal also relies a great deal on vegetal computing protocol (VCP) and an underlying layer of green code that has not yet been discovered by your computer scientists. Another development is that, after initial frustrations, we have started working on a special patatechnological environment that stimulates a potent experience of vegetal consciousness. MFM: He's talking about the cargo cult interior design challenge! Part II of this interview will follow shortly. We're redesigning the Snoepwinkel. Constantly. Everyone has different ideas about the best way to trick visitors into the right state of mind through our new campaign: the Plant Communication Cargo Cult. Some of us go for major redesign - like even removing walls and ceilings. Others are suggesting a subtler approach, but will anyone notice? Electricity, plants, humans, microscopes - it's a big entangled mess, but something seems to be working. People's vegetal synapses are firing when they come in, according to Bud, who measures their brainwaves. But we're about to fuse it into something beyond mere interior design. It's going to become real. It's all dark outside, we can hear muted sounds of windmills turning somewhere in the distance the city is so quiet, and we''ve just performed our customary trans-species edge-blurring rituals. 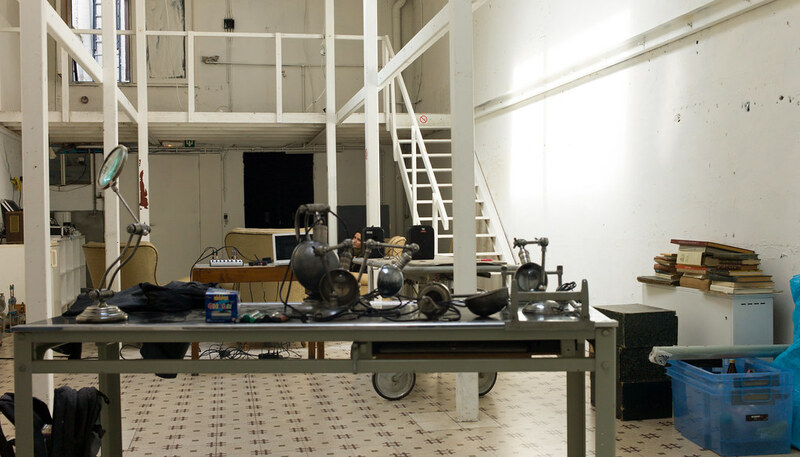 Now Eleuz will cast a geas on the still-fragile connections between plants and machines that we've worked so hard to decorate the space with. Australiskuv cruzaqab fungiyip hoilunk kachziachy. Mazmaunkorschibuzqab, zuzilyip bauirizchy; cauizbokunkcomzimaz - fluischachy. I am still working on the details, but I believe that this poster is speaking a heretofore undiscovered plant dialect (no doubt because he is from Australia); he may even be trying to write poetry. I can identify many of the particles used, and the overall syntax is quite familiar (of course it follows the broader patterns that anyone communicating with plants will be aware of: any word can in principle be transformed into any other part of speech by the use of verbal, pronomial, nominal adjectival, etc. particles). The real challenge in reading such languages is interpreting the metaphorical transmutations of the base words - plant languages are, after all, usually transparently simple at root; it is in the highly elaborated and ornate lattice of simile, metaphor, metonymy and so forth that weaves through the base meaning which often renders an accurate translation quite impossible. To get back to the above mushroom poster, I would suggest that we provisionally call his language Onezyazpraizunkkirinzgiz, or Cucumber dialect (literally, “door with choir of cucumber”; the final particle is merely convention). A note to clarify Eleuz's post. Forgive me if I am stating the obvious, but some things might not be clear to first-time readers of this forum. I want also to cast doubt on the notion that a new Psilocybe dialect has been discovered here. The subaeruginosa mushroom posting above is not of course writing on a keyboard in the Latin alphabet. We don't know for sure (he has yet to respond to our extremely keen PMs), but in all likelihood he has connected wirelessly to a neurobiological language transcoder, one that is able to interpret the bioelectric wavelengths used in thought transmission by this species of Psilocybe and convert them to a interspecies-readable or audible format that is remarkably accurate, all things considered. Furthermore, I have a hypothesis. Pace Eleuz, what he supposes to be an undiscovered dialect could in fact be the separate or convergent result of two factors quite unrelated to actual dialects at all. Firstly, we must assume that the poster is working from the southern hemisphere, as he is a species that does not exist anywhere else. Due to the sensitive and fragile nature of plant thought transmission, a communication event conveyed from southern to northern hemispheres will be affected by the phenomenon of seasonal-magnetic reversal (SMR), which, we have found, alters the communication in extremely specific though largely unpredictable ways. (This assumes that he was using morphic resonance across hemispheres before his transmission was intercepted by the NBLT.) Particular syntactic elements may be swapped for others; for example, particular postpositions (or particles) may have been transposed from one sense to another in regular though almost always unrepeatable ways. Secondly, the mushroom may be using technology found only in the southern hemisphere; in which case, all bets are off and we can only guess at the particular transcoding algorithms used, as we have not yet had the chance to examine one of these biomachines (assuming that they even exist). In sum, it would be premature to leap to conclusions about the discovery of a new mushroom dialect. I strongly believe the more likely possibility is that this subaeruginosa was communicating in perfectly standard Psilocybish, which has been distorted through the mechanisms mentioned above, and in such a precise manner that the semblance of a new dialect has been created. Nosinzizxvlu, zingiabok-onezgiz guziminzchyyaz gragizchy. Phanizchin! They have in fact come down from the roof now and seem to be growing quite obsessed with the kokedama as potential test subjects. 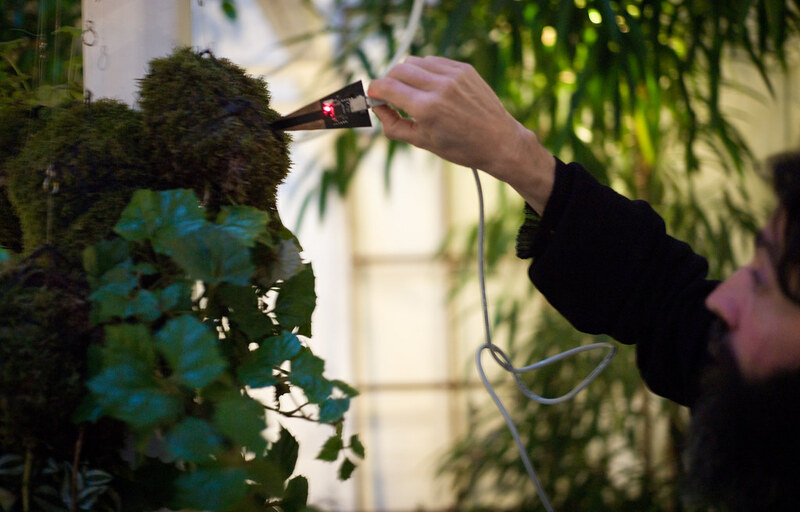 The recent (human assistant) arrival can be viewed here in some action shots where he appears to be engaged in preliminary tests of a custom-designed electrical interface on an unsuspecting kokedama. On the human side of these initial plant-human interface experiments, they are looking into an amplifier/coil setup commonly known as the “God helmet,” that apparently interfaces directly with the occipital lobes. Their efforts are laudable and undoubtedly fascinating, though also quite puzzling and obscure. We have not seen our assistants so avidly excited about their work in a long while, and it is pleasant and rather amusing to see them fully immersed in activities that they find meaningful. Sprouting: fungi, diodes, bioluminescent exhalations, pinstripe tattoos. Amidst Ashton's howling hoots of amusement, the inspiring buzz of electricity, the plants and wires and circuit boards - nothing happened. Things just don't fuse together like they do in our reality; the magic glue connecting our herbal technologies doesn't stick. We're going to have to rely on our research assistants and their tireless work on plant-machine translation. This was a cross-species edible language experiment conducted by myself and recorded by Mandrago long ago. He lost his lab notebook and so we are unable to determine which words came from plants and which from humans. I had hoped he would find it in the meantime, but unfortunately not. There was this paper and stuff you could eat, and then all these strange words came out of our mouths. Do you have any more? As one of the moderators of the forum (and in my capacity as Chief Officer of Multiple Personalities), I am of course committed to keeping this forum free of ill-intentioned or inflammatory comments, trolling, spam, flame wars, and so forth. However, within reasonable parameters, I would also like to encourage freedom of speech and the frank expression of multiple viewpoints (and personalities) - which will inevitably sometimes be contradictory, incongruous, and even positively antagonistic to one another.